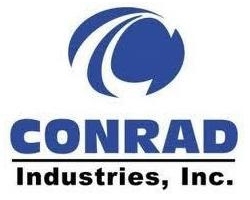 Conrad Industries, Inc. (OTC Pink: CNRD) announced today the successful completion and delivery of the Clean Jacksonville, the first LNG bunker barge built in North America. The Clean Jacksonville was constructed in Orange, TX, at Conrad Orange Shipyard, a subsidiary of Conrad Industries, and the safe and successful gas trial execution took place in Port Fourchon, LA. The vessel will enter service for TOTE Maritime Puerto Rico in the Port of Jacksonville, FL, where the vessel will bunker two Marlin Class containerships operating on LNG fuel between Jacksonville and San Juan, Puerto Rico. “TOTE Maritime Puerto Rico is excited to utilize the Clean Jacksonville for our LNG bunkering. Our partners, including Conrad Shipyard and GTT, have been critical in our development of North America’s first LNG bunker barge. 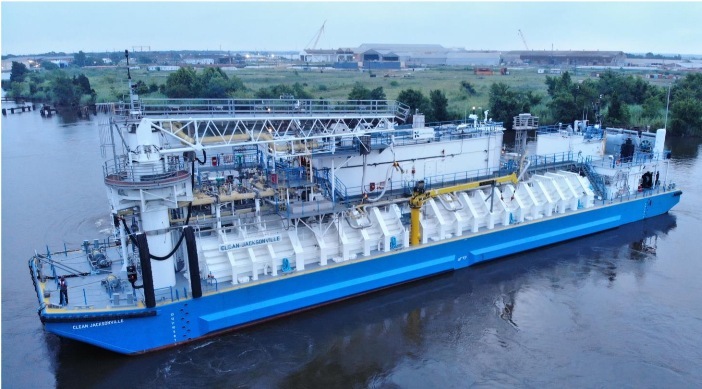 The use of LNG as a maritime fuel results in tremendous environmental benefits – including air and water quality improvements - and this barge is the final critical component of our LNG program in Jacksonville” noted Tim Nolan, President and CEO of TOTE. Mr. Philippe Berterottière, Chairman and CEO of GTT, added: “GTT has been honored to play a key role in the successful delivery of this first US LNG bunker barge by Conrad. The broad collaboration between TOTE, Conrad, the myriad project stakeholders, and U.S. regulators led to the successful design, construction, and commissioning of this unique and ground-breaking project. Beyond our traditional role of designing the cargo containment and other cryogenic elements, such as the innovative REACH4™ bunker mast, GTT adapted and expanded its support services to ensure the effective training of the barge crew and the safe and satisfactory execution of the barge commissioning activities and gas trials. Image by Conrad Industries, Inc.
Conrad Industries, Inc., established in 1948 and headquartered in Morgan City, Louisiana, designs, builds and overhauls tugboats, ferries, liftboats, barges, offshore supply vessels, LNG vessels and other steel and aluminum products for both the commercial and government markets. The company provides both repair and new construction services at its five shipyards located in southern Louisiana and Texas.